Critically acclaimed, Schleppin’ West, the exhilarating album from the Best Little Klezmer Band in Texas is available for sale. Experience the musical tradition of Klezmer doinas, freilachs and Yiddish favorites… all with a Texas Flair! Call (800) 332-0689 to order your copy today! A lost musical world that was once one of the central cultural expressions in the life of Eastern European Jewry is being recreated today in the music of America's latter-day Klezmers . With the destruction of the last shtetls (small towns) in Eastern Europe five decades ago, this rich tradition was silenced. Then something unexpected happened: In Grandmother's attic there surfaced old 78RPM recordings from that bygone era. And gradually, in America, in Western Europe, in the former East Germany and as far away as Japan, young musicians began to reestablish their connection with their own musical legacy. Over the last twenty years Klezmer music, true Jewish folk music, began as a flow that has become a mighty stream, a stream of renewal, a stream that is reconnecting a younger generation of Jews with its ancient, enduring customs. Who knew that just six weeks after the most joyous moment of my life, after the stomping of the wedding glass to the universal shouts of "mazl tov!" our life in Ganeydn - our Garden of Eden - our Paradise - was about to end. We're being transferred where? To Houston! With a sinking feeling I sensed I was about to be thrust headlong into an epic culture shock: from cosmopolitan Chicago to the deserts of the Southwest. Could there be Borsht on the Bayou? Yiddishkayt in Texas? Yesterday we celebrated my brother Avrohn's wedding to Dvorka, you know, the one we called 'die wilde'. The whole shtetl was there. You should have heard the klezmorim! Yankele Grossbart played his clarinet as if he had learned music from King David himself. The fiddlers, black Shmulik and red-haired Itzik played as if they had been touched by angels. We danced to their Freylakhs late into the night. If only you could have been with us! It is their music that brings our ancestors back to life, our ancestors from Odessa and Lodz, from Podgorzse and Berdichev. My grandparents were among the first wave of Jewish immigrants to arrive in the Goldene Medine - the Golden Land, America - in 1881. They brought along their customs and traditions that had kept Jewish families together. The melodies they sang, the music they played at family gatherings, brought with them the feeling of the shtetls they had left behind. Their music, now our music, is the unbroken chain that binds us to our Jewish past. And so, with our first album, SCHLEPPIN' WEST, we bring you a taste of home. Oyf a gute shuh; may we meet on many happy occasions." "...now that's good schlepp! Your new CD's a mamaloschen delight." Schleppin West is great fun loaded with heart and soul. "Dayn Klezmer muzik iz tsu mir vee vasser in midbor." "Your Klezmer music is to me like water in the desert." 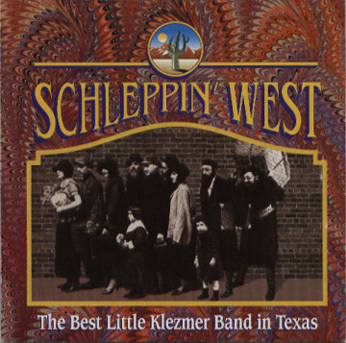 I loved your Klezmer CD, Schleppin’ West. It touched my heartstrings as my parents were from Russia & I listened to this music sung by my parents and their friends. It is so touching to me. The CD is fabulous and the purity and clarity of the singers and instrumentalist is really sensational. It really kitzled my old heart, which by the way, was 86 this cinquo de mayo. I’m still playing drums with a little trio that plays three times a week at Jimmy Buffet's "Margaritaville" in the French Quarter, two blocks from where I live, and they have house drums, so I only have to schlep my cymbals. Please give my sincerest congratulaions and sincerest admiration for a work of art. The Official Schleppin' West Tee Shirt! Available in 2 different versions for the back of the shirt.